It's one of the most coveted seats in the world. And it's free. It's a spot along the most famous red carpet of the year: The Academy Awards Red Carpet. 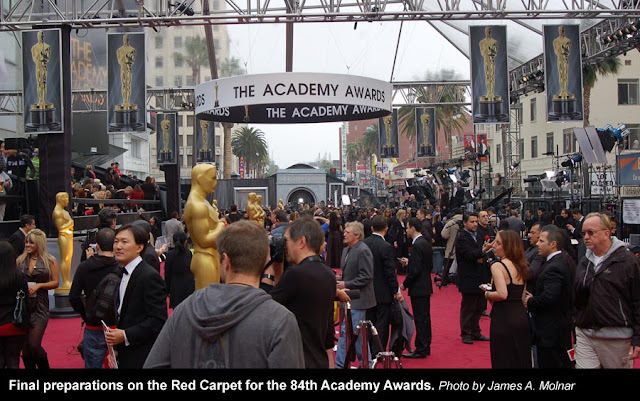 Around 700 lucky fans will be selected in a global online lottery to sit in the bleacher seats flanking the Red Carpet at next year's 85th Academy Awards. It's one of the most coveted seats in the world. And it's free. It's a spot along the most famous red carpet of the year: The Academy Awards Red Carpet. Around 700 lucky fans will be selected in a global online lottery to sit in the bleacher seats flanking the Red Carpet at next year's 85th Academy Awards on Feb. 24. Bleachers at the 80th Academy Awards. Those whose names are selected will be notified on or around Nov. 20. In previous years, as many as 20,000 fans have entered the lottery. NOTE: The lottery is for seats ONLY; no airfare or hotel accommodations are provided. A background check is also required if you are selected. 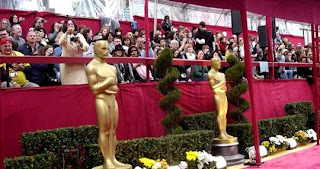 Fans at this year's “Oscar Fan Experience,” sponsored by JCPenney, received goodie bags with candy, potato chips, popcorn, soda, sunscreen and face wipes, along with other gifts. They arrived early for a full behind-the-scenes day in seats viewable on TVs around the world. Once the Red Carpet was empty, bleachers fans were invited to an Oscars viewing party at the El Capitan Theatre across the street. In the past, the Academy kept registration for the contest open only for one week. This year, the nonprofit organization is extending that period to almost two months. This editor was lucky enough to be selected as a bleacher fan in 2008 at the 80th Academy Awards. 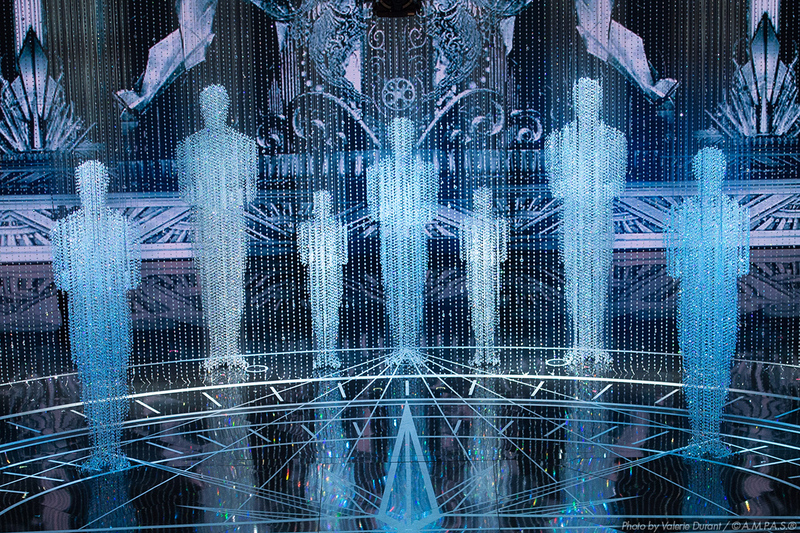 It is quite the experience, a 12-hour-plus day chock full of the biggest names on the biggest night in Hollywood. The energy is palpable. Fans yell and scream for nominees and movie stars to look their way and wave. Being a fly on the wall there was unforgettable. This February, fans interviewed were Jane Tackett, from Orange County, Calif.; Angela Deeney, from Tewksbury Twp., New Jersey; and Erin Rea, from Daly City, Calif., who brought her daughter's bear, Emma, to the bleachers with her. Rea said she was looking forward to George Clooney on the Red Carpet (watch the end of the video to what happened). Fans interviewed in February 2010 were Karen Pulgiese (Chicago) and Rachel Pugliese (Dayton, Ohio); Francine and Elmer Armstrong (St. Louis), Courtney Cornelli (St. Louis) and Tina Hernandez (Huntington Beach); and Marquette University '80 alum Sherry Saccoliti (New Jersey) and Yolanda Muñoz (New York). Some of the fans are the most dedicated, sitting in the section for more than a decade. Anyone know when the register for belcher seats to the 87th academy awards are open? Thanks for your question, Christina. Last year, the Academy went to a new system for choosing bleacher seats, called "Fan Appreciation Week" at the beginning of December. The nonprofit organization used social media to determine to whom it would give tickets, seeking out the biggest fans. We can only assume the Academy will continue with this trend again this year. Stay tuned to The Gold Knight for complete coverage. Our only recommendation at this point is to make sure you are engaging with the Academy on social media. Good luck and let us know if you see anything.